Kawasaki disease (mucocutaneous lymph node syndrome) is a rare childhood disease that causes inflammation in the walls of small-sized and medium sized arteries. It is most often seen in children under the age of 5 of Asian descent (primarily Japanese of Korean). It is somewhat more common in boys than girls. There is no known cause for this disease and it is not contagious. There is no single test for Kawasaki disease and in order to diagnose it, you must look for symptoms. The symptoms and criteria for diagnosis can be remembered by the mnemonic “CREAM”. 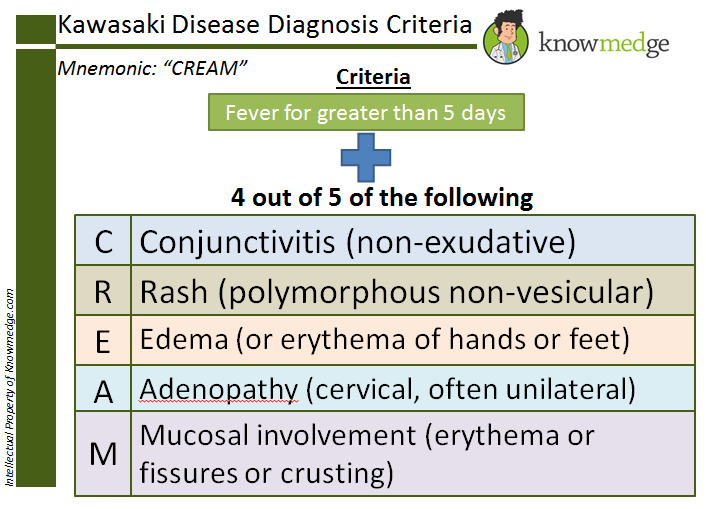 The criteria defined for diagnosis is that the child must have fever for greater than 5 days and must show four of the following five symptoms. This is the fourth in our series of Medical Mnemonics Monday posts. You can all previous and future medical mnemonics here.